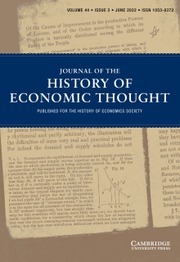 The Journal of the History of Economic Thought (JHET) is the journal of the History of Economics Society. JHET is a quarterly, refereed journal that welcomes papers reflecting the full spectrum of scholarly analysis within the history of economic thought and history of economic methodology. The mission of the journal is to further the objectives of the History of Economics Society. These are to promote interest in and inquiry into the history of economics and related parts of intellectual history, facilitate communication and discourse among scholars working in the field of the history of economics, and disseminate knowledge about the history of economics. JHET is a scholarly publication of international distinction. In addition to publishing widely read and cited peer-reviewed articles, it features a regular book review section including reviews by leading specialists. Ian Kumekawa, The First Serious Optimist: A. C. Pigou and the Birth of Welfare Economics (Princeton: Princeton University Press, 2017), pp. 352, $35 (hardcover). ISBN: 9780691163482. Sonja M. Amadae, Prisoners of Reason: Game Theory and Neoliberal Political Economy (Cambridge: Cambridge University Press, 2016), pp. xxxix + 333, $120.95 (hardcover). ISBN: 9781107064034. Gareth Stedman Jones, Karl Marx: Greatness and Illusion (Cambridge, MA: The Belknap Press at Harvard University Press, 2016), pp. 750, $35.00 (hardcover). ISBN 980674971615. DID IRVING FISHER REALLY DISCOVER THE PHILLIPS CURVE? Richard P. F. Holt, ed., The Selected Letters of John Kenneth Galbraith (New York: Cambridge University Press, 2017), pp. xlii + 701, $34.99 (hardcover). ISBN: 9781107019881.